A bird table is a must in any garden, especially in winter months, when food sources for our feathered friends are scarce. But birds sometimes have uninvited dinner guests: squirrels. They may look like sweet little critters, but have quite the appetite, and can wipe out your bird table in a flash. Check out our top squirrel-busting tips to ensure your delicious seed mix is ending up in the right claws. Why keep squirrels away from bird seed? Grey squirrels may look cute, but as a dominant, invasive species they can have a negative effect on woodland biodiversity (Woodland Trust). Evidenced by their infamous ousting of their cousins, our native red squirrels, from British woodlands. You may face real problems if too many squirrels find their way to your garden – they’ve been known to dig up beds to bury their nuts, eat your plants, and strip the bark from trees. On top of this, they pillage your bird feeders, leaving their avian neighbours to go hungry in the winter months. If you have space in your garden, the best way to prevent theft is to hang your feeder a good distance away from trees and anything else a squirrel might use as a springboard. This can be quite the challenge – bear in mind that the average squirrel can jump about four feet off the ground, and up to nine feet horizontally from a running start! You may need to use a back-up deterrent, too. If your house is far enough from trees to prevent squirrel invasion, try a window mounted feeder. They’ll struggle to get a good enough grip to climb up the glass – but never underestimate them. If squirrels do manage to infiltrate, they’re likely to pull the suction cups off the glass, and you’ll be faced with major seed losses. Invest in a squirrel proof bird feeder to thwart potential thieves. There are various kinds of squirrel deterrents on the market, including smart feeders with built in ‘traps’, that use weight sensitive mechanisms to boot off large intruders, as well as simple cages and seed-release systems. Luckily, most garden birds are quite small, and can squeeze into tighter spaces than a squirrel can. Protect your feeder with a cage or a clever seed-release mechanism, and squirrels won’t be able to get their little paws on your inviting seed mix. An added bonus of this method of squirrel-proofing is that larger birds find it harder to use them, allowing the endearing smaller species more of a look-in at feeding time. Place a conical, cloche-style or disc-shaped baffle on the pole, further up the stem than the squirrels can jump. It’s best to use a metal baffle, as squirrel’s strong teeth can gnaw through most plastics. Grease the pole with a lubricant such as petroleum jelly, so they can’t climb up the shaft. Repurpose a childhood toy and attach a slinky, or a purpose-built squirrel deterrent spring, to your feeder pole – for an added bonus, you’ll get some laughs watching the pesky critters try and work it out! Place a conical or round baffle above a hanging feeder – or make a DIY baffle with a biscuit tin, or a plastic drinks bottle. If your feeder is hung from a washing line, thread segments of hose pipe or empty plastic bottles (anything that rolls will work) on either side of the feeder. Lucky for you, squirrels might be gluttons, but they won’t eat everything. But niger (aka nyger) seeds are oil-rich and highly nutritious, and while they’re loved by birds like finches, squirrels will pass them up in distaste. 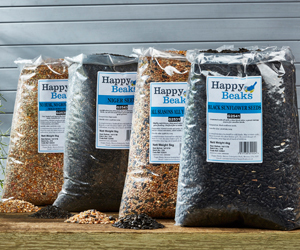 If you want to make sure you’re catering for birds rather than squirrels, try adding capsaicin to your bird seed mix. It’s the active ingredient in chillies that makes them hot to the taste. Mammals have a low tolerance to the heat, but birds aren’t affected by it. Once your friendly neighbourhood squirrel has had a face-full of spicy seeds, he probably won’t come back for more. We know squirrels can be wily, and sometimes they manage to outsmart us, no matter how many lines of defence we deploy. Why not embrace their presence, and set up a separate squirrel feeding station, which will reduce their impact on your birdseed supplies, and encourage garden harmony. Do you have any squirrel-proofing tips that you think we should know? Drop us a line over on our Facebook page.